ImageSkill Software is glad to present our new Adobe-compatible plugin - ImageSkill PixPattern It allows you to transform your photos into a mosaic that is formed satisfying your desire from a set of polygons differing by shape. Plugin keeps original color content of your photo being able to keep the same color within any separate mosaic element. You can enhance the mosaic effect by adjusting the size and orientation of the mosaic elements. PixPattern has a stylish user-friendly intuitive multi-lingual interface. The plug-in has simple install and uninstall procedures and automatically detects suitable graphics hosts. To install it just run the installer and select your graphic host or plug-in folder. ImageSkill PixPattern is fully compatible with Adobe Photoshop and Photoshop Elements, Macromedia Fireworks, Corel (Jasc) Paint Shop Pro, Corel Painter, Corel Photo-Paint, Microsoft Digital Image Suite and etc. 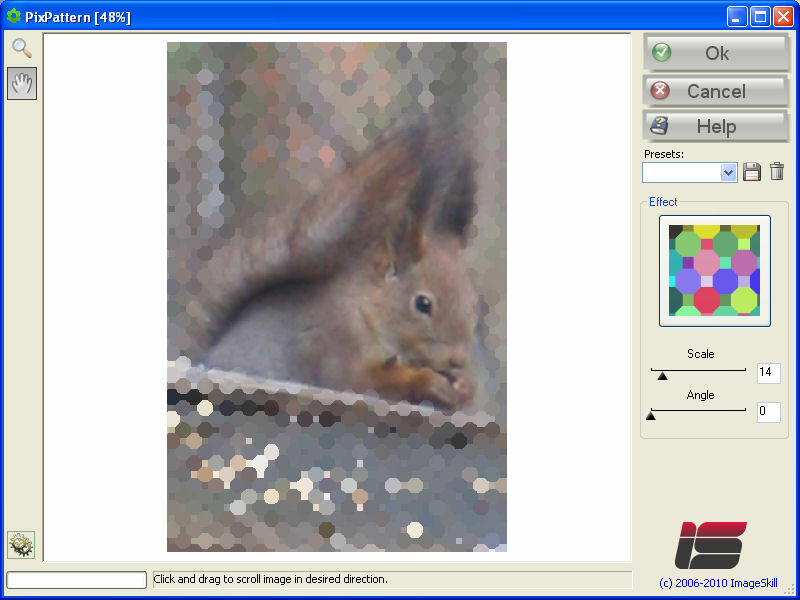 ImageSkill PixPattern runs on Microsoft Windows 2000/XP/NT/Vista/7. The full version of ImageSkill PixPattern is available in English for $14.95 including VAT, downloadable from www.imageskill.com. Just now, we upgrade our products for registered customer free of charge within the same major version number. Press release is classified as public and may be used by anyone for any purpose.